Voters who choose to sit out this June 3 election do so at their own peril. And we might add, ours, too. The ominous Measure M gets this year’s award as the Trojan horse with its too-good-to-be-true language. The 2nd District showdown pitting incumbent Janet Wolf against challenger Roger Aceves — and his oil-industry-financed campaign — threatens to tilt the fundamental balance of power at the board of supervisors. And in the race for Count Sheriff, we have a candidate in Bill Brown who actually did what he promised in his campaign. So here is the second installment of The Santa Barbara Independent‘s endorsements for the June 3 election. You don’t have to agree with us; just consider our points, and then vote — by mail or in person. Just vote! Sheriff Bill Brown isn’t Superman. But he did secure $120 million in state funding to build a new North County jail, and by Santa Barbara County standards, that qualifies as the next best thing. As much as this paper abhors America’s unsustainable appetite for “lock-’em-up” laws, the reality is that Santa Barbara’s South County Jail has been in serious need of replacement for decades. Not only is it crammed to the gills, but it is unsafe for inmates and staff alike. That qualifies as inhumane. For nearly 30 years, the construction of a new North County jail has been one of the holy grails of Santa Barbara politics. Brown’s predecessors ​— ​some of whom were blessed with remarkable political gifts ​— ​all thrust their shoulders to this wheel; all failed to deliver. That Brown managed to acquire the land and talk $120 million from state agencies headquartered in Sacramento needs to be recognized as the remarkable accomplishment it truly is. And he was able to achieve this in the middle of the Great Recession. 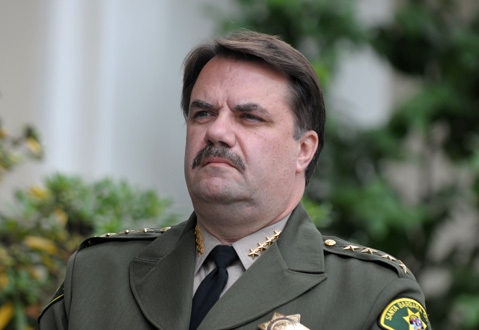 When Brown first ran for sheriff nine years ago, he pledged to get the new jail built. How many elected officials make good on campaign promises? About $80 million will be spent to build a traditional 376-bed facility in North County, which will be completed in 2018. Another $40 million will be used to build a 228-bed facility designed to prepare inmates for the life skills needed when released. If all this seems expensive, it is. And these numbers only tell part of the cost. For example, the county will have to spend roughly $20 million a year to run the larger facility. That money has already been snipped out of the general fund. But as the state was forced to relocate thousands of less-threatening prisoners to avoid the wrath of federal judges, the Santa Barbara County Jail, already overcrowded, was compelled to absorb a whole new population — 150 on any given day. The court system ​— ​itself egregiously underfunded ​— ​has failed to process its criminal caseloads in a timely fashion. As a result, the number of county prisoners held behind bars while awaiting trial has nearly doubled. Add to the mix prosecutors who file “commercial burglary” charges on simple shoplifters, and you get system overload. We need a North County Jail. But we need more. Although public-safety departments were spared the full brunt of budget cuts when the economy tanked, Brown’s department took a major hit. Sixty-four full-time positions were eliminated. Restorative-justice and community-policing initiatives ​— ​which Brown championed early in his career ​— ​were never able to expand effectively. The County Jail has been the site of large-scale hunger strikes, multiple lockdowns, and other incidents. It is urgent that Sheriff Brown focus far more of his considerable talents on addressing these pressing problems now and not wait until 2018. We are confident that, when reelected, he will do so. 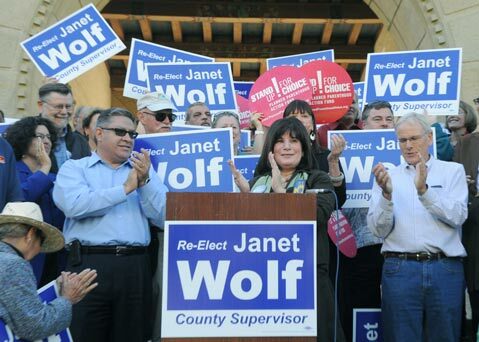 The most immediate and obvious reason to re-elect Supervisor Janet Wolf to a third term is the resolve she demonstrated in protecting county air-quality standards in the face of a political onslaught waged last fall by Santa Maria Energy. The company’s proposal to operate 136 onshore wells near Orcutt would have generated about 88,000 metric tons of greenhouse gases a year. While that’s not enough to singlehandedly melt Greenland’s ice sheet, it is far more than Santa Barbara County ​— ​and many other jurisdictions ​— ​traditionally allow. In years past, the county’s line in the sand has been to require environmental mitigation and offsets for oil and gas projects generating more than 10,000 metric tons. But this was no traditional project, and county energy planners and the county planning commission both were persuaded the project should be given greater latitude to pollute, raising the maximum emissions allowed to 62,000 metric tons. With Wolf’s vote, however, the county supervisors insisted that the tougher standards be met despite theatrical lamentations ​— ​over the 62 cents a barrel of additional costs ​— ​by the energy company and its supporters. Wolf did more, however, than merely vote the right way. When she discovered that Lompoc’s representative to the Air Pollution Control District was a paid publicist for Santa Maria Energy, she blew the whistle about a possible conflict. That was classic Wolf: prepared, determined, and willing to ask the tough questions. Likewise, we agreed with her key vote to maintain the status quo with regard to the rocks and boulders protecting the sands of Goleta Beach from being swept down shore. In that instance, Wolf parted company with many in the environmental community ​— ​who instead promoted a program of “managed retreat” when it came to the single most popular park in Santa Barbara County. In this, she displayed another laudable trait: independence. Wolf is currently facing a serious challenge from Roger Aceves, Goleta’s former mayor and longtime member of the Goleta City Council. In years past, the two were closely allied. While we’re somewhat mystified by Aceves’s entry into the race, it is a free country, and he’s certainly entitled. More troubling by far, however, is his strong support for Santa Maria Energy and, likewise, the company’s generous financial support for him. His election would not bode well for county air-quality standards. Aceves, a passionate partisan for all things Goletan, remains convinced his city got a raw deal from the county when it first incorporated. He may, in fact, be right, but the Goleta contingent signed the deal with their eyes wide open. To renegotiate the terms now, as Aceves has demanded, would bolster Goleta’s bottom line, but only at the expense of the county’s coffers. Why county voters would choose to elect someone clearly advocating against their best interests is beyond us. By contrast, Wolf has done exactly what she’s pledged to do: work hard, come prepared, speak her mind, and ​— ​on occasion ​— ​step on toes. She’s earned a third term, so please give it to her. Measure M reminds us how for every complex problem, there is always a very simple solution, which, invariably, is flat-out wrong. In this case, it’s even worse. Measure M, hatched by 4th District Supervisor Peter Adam, would require the County of Santa Barbara to spend whatever it takes each year to keep county roads, county buildings, and county parks from deteriorating any further. How could anyone argue with something so seemingly benign, innocuous, and sensible? Because it’s none of the above. With Measure M, Adam ​— ​a passionate believer in limited government ​— ​has launched what appears to be a frontal assault on the machinery of government but is in fact an act of political sabotage. If Measure M were to pass, it would drain $18 million-$44 million a year from the county’s general fund. The question that Adam and his allies have thus far declined to answer is where that money will come from. What existing programs will have to be cut and gutted so that the county’s rural roads are maintained at their current levels? Fire protection? Public safety? Mental health? To put this additional financial obligation in proper perspective, voters should understand county supervisors enjoy limited budgetary authority. Of the county’s $850 million budget, about 75 percent comes with state and federal strings attached that cannot be legally snipped. Of the remaining 25 percent, over which the supervisors possess any discretionary authority ​— ​slightly more than $200 million a year ​— ​60 percent is currently allocated to public safety. And the timing could not be worse. In the wake of the Great Recession, the County of Santa Barbara has already cut 580 positions. There is precious little wiggle room left in the budget. As a practical matter, not one cent of the money mandated by Measure M will pay to fill a single pothole on any of the busy city streets. Instead, it will be spent exclusively fixing county roads, which happen to be some of the least-traveled thoroughfares in the county. But city dwellers ​— ​as well as everyone else in the county ​— ​will suffer when important public services get the ax. We do not dispute the importance of maintaining our roads and county properties. And certainly our county roads need help. But this problem is not unique to Santa Barbara. The system by which road repairs have been traditionally financed for decades is falling apart everywhere throughout the United States. New solutions urgently need to be found, but Measure M ​— ​which would straitjacket the spending decisions of elected officials for decades to come ​— ​is decidedly the wrong way to go. It’s just that simple. You can’t save money without spending a little up front, and Proposition 41 — a k a the Veterans Housing and Homeless Prevention Bond Act ​— ​allows the legislature to sell $600 million in general obligation bonds to build new multifamily housing for homeless veterans. Given that all experts agree providing health and mental-health services to people on the streets is exorbitantly more expensive than providing it to those in fixed housing, passage of this urgently sensible measure should be a no-brainer. Given that California is home to one-quarter of all homeless vets in the United States, it’s even more justified. Lastly, the state legislature recently disbanded all California redevelopment agencies, the entities traditionally most responsible for funding such housing. With these agencies gone, Prop. 41 is needed to fill the breach. If you think it costs government a lot to keep public records open to the public and that the people’s business gets conducted by light of day, consider the alternative. Proposition 42 would amend the state constitution requiring that local government agencies maintain public records and open meetings regardless of the compensation level provided by the state legislature. To some extent, we sympathize with local governments. In response to the recent recession, the legislature has shifted the financial burden of state open-government laws onto the local agencies responsible with carrying them out. We get the gripe. Regardless, such laws are both essential and fundamental. As such, they cannot depend upon the precarious whimsy of funding formulas.